Communication creates influence. And influence enables communication to resonate. They’re inextricably linked. In Making Ideas Move, our series produced in partnership with Stanford Social Innovation Review, Judith Rodin, the President of the Rockefeller Foundation, and Neill Coleman, Rockefeller’s Vice President of Global Communications, share 5 steps to building influence in Greater Influence, More Impact. 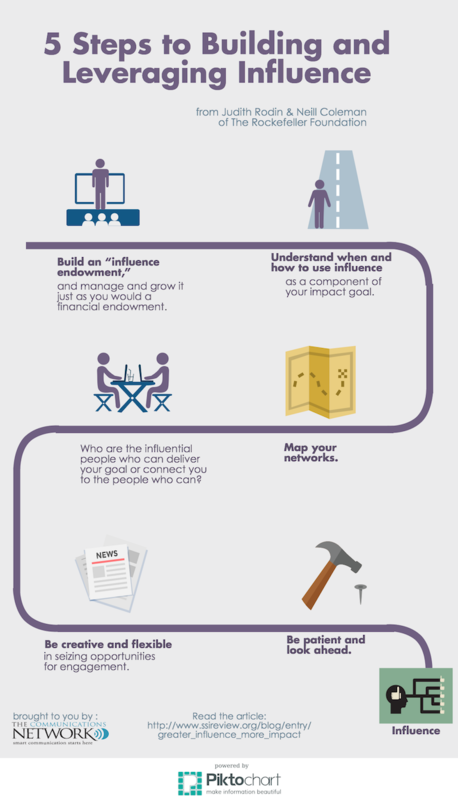 Check out the below infographic for a roadmap on how to leverage your organization’s influence to create impact. To learn about more qualities that make an organization excellent at communicating, please visit www.com-matters.org/attributes.